Jennifer has been lecturing me for a good five minutes on how I really don’t need to be affected by what happened to me when I was a child and that if I continue to react with flashbacks, nightmares and chronic pain, it’s my choice to do so and I really can’t expect any sympathy. She’s doing it with a smile on her face and her voice is light and tinkly like a goldfinch, but I’m more than a little taken aback. Because, as I’ve just explained to her, if I could get over it, I would. There’s a strange kind of logic in the mind of people like Jennifer. On the whole, they are well-meaning. They want to see us ‘well’. They are bothered by our symptoms, and at least they acknowledge them, which is more than most people do. The problem is that they don’t understand the back brain, domain of trauma, with its automatic, survival-based reactions, and so they assume, simplistically, that we can solve it all with our decision-making front brain. I wanted to argue that studies show that it’s not a simple formula of calories in versus calories out, but Jennifer is having none of it. In her mind, if I want to lose weight, I just need to want to, and do it. If I want to be rid of trauma, I just need to want to, and do it. And I need to stop making excuses. In Jennifer’s mind, the fact that I’ve tried, many times, for many years, just shows that I haven’t tried hard enough. The only conclusion I can, therefore, come to is that I am lazy and defective. (No wonder she’s irritated with me). And being (apparently) lazy and defective, my shame increases and so do my symptoms. It’s a vicious circle. Following Jennifer’s numerous ‘pep talks’, I would lie in bed on a morning and decide that today was the day when I would ‘get over it’. Come on, I would say to myself, firmly, albeit lacking conviction. Let’s just stop it. Let’s get up and get on. I don’t need to feel like this. I’m just making it up anyway. I need to stop attention-seeking and just get over myself. I’ve had enough of being like this. I just want to get back to normal. So today I will. Sometimes I would be able to pretend to myself that my heart wasn’t really racing at 120 beats per minute and that the diarrhoea was just a reaction to what I’d eaten last night. I’d force myself into productivity and get on for a good couple of hours, because I was ‘putting the past behind me’ and ‘moving on with my life.’ No point dwelling on the past, I would say to myself as another flashback swept in from the side. Naturally, I couldn’t sustain this unreality for very long. The pain, the vomiting, the loss of consciousness, the switching … It was real, and my denial of it was making things worse, not better. ‘You just have to be firm with yourself,’ Jennifer explained when I described my symptoms. What she didn’t explain was what ‘being firm’ meant, or how it could possibly help. I’d been ‘firm’ with myself all my life. What actually was going to help was some self-compassion, not more self-abuse. But she didn’t know that because, like most people, she didn’t know the first thing about trauma. She thought that trauma is about being upset about something. Stop being upset about it (be firm with yourself) and move on. It’s not entirely bad advice for minor life mishaps, like catching a bollard with the car door or someone forgetting your birthday. It’s woefully inadequate for trauma. Because it doesn’t take into account that ‘being upset’ is low on the list of impacts that trauma has. In fact, due to the very nature of trauma, we may feel no upset at all. We may not even remember the trauma in the first place, as amnesia protects us from its mutilated awfulness. How then do you ‘get over it’, if you can’t even remember it? How do you stop being upset about something when you don’t feel anything at all? Trauma fundamentally changes the way our brains and bodies work. It is an adaptation to what our minds perceive – outside of conscious thought, awareness or choice – to be an imminent threat to our life or physical integrity. Trauma is a cascade of animalistic responses wired deep into our neurobiology with millions of years of evolutionary survival imperative at its core. We can no more stop ourselves reacting to trauma than we can stop our hair growing. Trauma manifests in our bodies and the primitive parts of our brain. Our ‘front brain’ – the thinking, intelligent, reflective, creative, choosing human brain that we tend to think of as our whole brain – is sidelined. Trauma resides instead primarily in our back brain – the ancient, survival-based, instinctive, automatic brain that operates largely outside of conscious awareness. This is why we can’t just ‘get over’ trauma. We can’t just make a decision: the front-brain makes decisions. But trauma isn’t in the front brain. It’s like deciding to slow our digestion, or stop our heart beating, or release more insulin: we can’t, consciously, do it. It’s the uncontrollability of the impacts of trauma that makes it so scary. It makes us feel helpless before it. If it’s out of our control, implanted deep in our unreachable back brain, outside of conscious awareness, outside of choice, does this then mean that we cannot recover from trauma? But we don’t recover from trauma by just deciding to ‘get over it’. We have to rewire our brain and nervous system: this is the work of psychotherapy. Not to talk endlessly and woefully about what happened, again and again and again, feeling sorry for ourselves and casting ourselves as the helpless and immutable victim – which is what most people seem to imagine we are doing when are going for some kind of mental health ‘treatment’. But a slow, steady process of retraining our body and brain to come out of the amber or red zones, of autonomic hyper- or hypo-arousal, back to the felt sense of safety of green. It’s about bringing parts of our front brain back online after the dropped connections of trauma. It’s about reframing, and mentalising, and developing ‘earned secure attachment’. It’s about working at the edges of our window of tolerance to bring unprocessed traumatic memory back into awareness so that the hippocampus, our brain’s ‘librarian’, can tag it as over. It’s about developing accurate ‘neuroception’, the ability to feel safe again in our bodies, after the unremitting ‘battle-stations’ response of our neurobiology. Treatment for trauma is lots of things, but it’s not something you do on a Monday morning because you choose to. It’s a meticulous process of deeply-wired brain change, not a decision. We can’t just decide not to be traumatised, just as we can’t decide for our heart rate to slow. What we can do, however, is create the right conditions for it to happen – sitting down, not walking up a mountain; in therapy, rather than in denial; committing to processing our past, not trying to ignore it. A few years on from my early encounter with Jennifer – right when I was in the thick of therapy, when things were really starting to change but at the same time it felt that I was buried alive under the pain and the mess of it all – I bumped into her at the supermarket. She smiled kindly but superciliously. ‘Aw that’s good to hear,’ she said, with her eyes almost tight shut in a patronising smirk. I curled my toes into the ground in an effort to subdue the urge to punch her. We chatted for a few minutes about everything I wasn’t interested in, until normal life overwhelmed me with its tedium, and we started to make our moves. She stared at me with her mouth slightly open and her eyeballs rammed to the edges of their sockets. I’ve just broken the rules, I thought to myself as a slight fizzle of panic chased up my spine. I’m not supposed to talk back. ‘Okay, well, take care, and hope to see you again soon,’ Jennifer said, and walked off quickly. Here’s the problem, I thought to myself. I had the trauma to deal with, and then I had people’s expectations of how to deal with the trauma to deal with. And it occurred to me, as it often did, that it was mainly the non-traumatised who had these expectations. People who had been traumatised were usually too busy trying to find the answers for themselves. My hands were quivering and I suddenly felt a great pit of hunger in my stomach. It’s okay, I said to myself, as I had been learning to. It’s okay. You just stood up for yourself. My mouth turned upwards into a smile and a little ray of hope warmed me on the inside. You can’t just ‘get over’ trauma because you decide to, I thought to myself. But you can recover from it. There’s a difference. And I walked on to find some mayonnaise. Oh wow. I wish I could show this to the friends and family and my GP who say that “put the past behind you” tome so so so much. They always seem so frustrated when they ask how I am and my answer isn’t what they hope to hear. It’s been too many years. It’s taking too long. And I’m now stuck in a hole truly believing that I am faking the DID and that nothing that bad every happened to me. I think you’re amazing and your blog is incredible. Nailed it. Thank you for expressing what I am not yet able to. I DO HOPE YOU ARE ABLE TO READ THIS COMMENT, CAROLYN. Just like EVERYTHING you write Carolyn, this article is AMAZING. And the timing is perfect. I have just left my position of 15 years, in a consumer lead organization (all staff and board are MH consumers and/or family members) dedicated to providing support to both inpatient and community individuals. I have loved working there. My boss’s intentions have been very supportive, but he is not someone with a trauma background, and as such, really has no idea. Over the last number of years, his intent has been to ‘help me’ so that I can ‘change the way I think’ and thus change my behaviours particularly at work. In your words “Here’s the problem. I had the trauma to deal with, and then I had people’s expectations of how to deal with the trauma to deal with.” The result was that constant push to ‘change’ made all my symptoms worse and increased all the negative thoughts about myself, resulting in my becoming too sick to work. I plan on sending this to him with a small, KIND note letting him know. The good news is that it pushed me into therapy and after 50 yrs I have finally been diagnosed with DID and I have found a therapist who I trust working with me. HaHa, I could think of a LARGE List of people who should read this. THANKS again for ALL THAT YOU DO!!!! Just wanted to say a big thank you for the wonderful PODS website! Such a wealth of information and experiences. I am a voluntary counsellor, with little if no experience of working with clients struggling with a dissociate disorder. I am beginning to get a firm understanding and feeling more empowered to work with clients . On the daily assault of my suffering part of having to look after myself is proudly standing up to the actual concrete truth of my trauma suffering – being traumatised by people who don’t ‘get it’ and what my life has endured can be proper misery so developing a protective bond with myself and in a very healthy way talking to these people to tell them the actual horrific and very poignant truth. It’s not about who I am mentally (more how strong I am mentally) and the physically abused exterior isn’t about who I am but what has instead been done to David. Within the daily assault of the suffering is a quiet steely resilience and great fortitude and endurance that this trauma and torture won’t define who I am – a lot of years in therapy will give back to David and I know that the only beautiful wonderful part of what happened to me was in fact my will to survive it all and then re-define my life. When people now say “hope you feel a bit better” and even mentally torture me with their ignorance I put in a self-protective and self-compassionate stance of educating them for what living with trauma mentally and physically actually is. Thank you for this article. It touches on so many points that most people don’t share or talk about and what it’s like to live as a trauma survivor. So many people really don’t understand and it’s in that non understanding that survivors can be potentially victimized again and again by being told they SHOULD let it go and get over it which just adds more shame to the original shame of not being able to do anything about being abused in the first place! Like in the article…. if I could, I absolutely would’ve already! I had this very discussion with my father this week, he said “you’ve just got to put it in the bin and move on”. 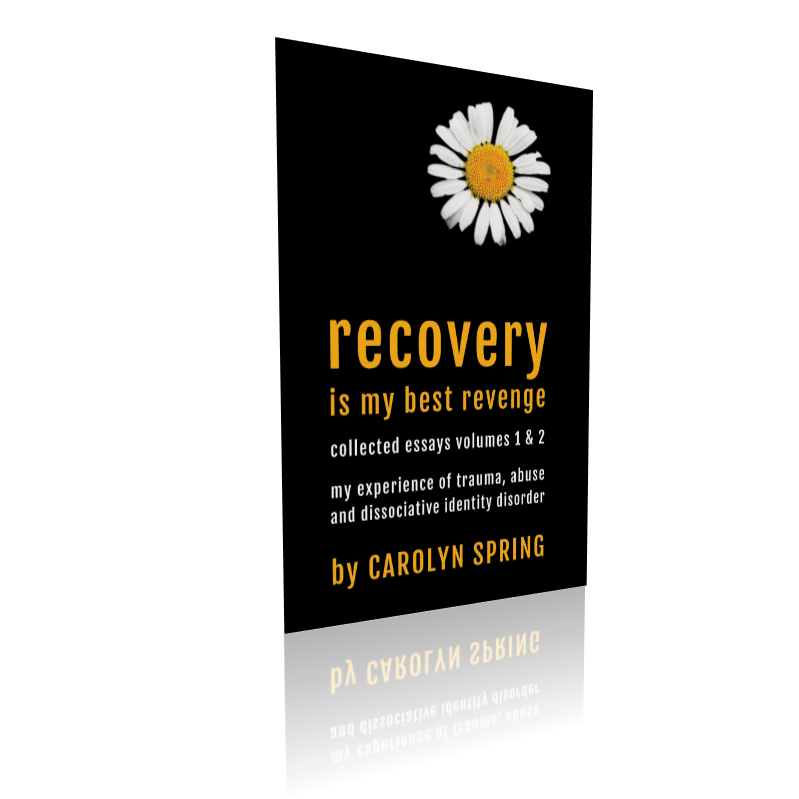 He does not support my recovery, begin to understand or take any responsibility. Thank you, I’ll show him this.